After losing their first game of the season last week the Seahawks look to bounce back in week 6 as they finish their tour of the AFC South by hosting the Tennessee Titans. The Seahawks hold a one game lead in the NFC West with a 4-1 record. The Tennessee Titans come into this game a somewhat surprising 3-2 and are one game behind the Indianapolis Colts for first place in the AFC South. Including the playoffs, the Seahawks lead the all-time series with the Houston Oilers/Tennessee Titans franchise 9-6. Their last meeting came in week 17 of the 2009 season. Chris Johnson broke the 2,000 yard mark on the season as the Titans defeated the Seahawks 17-13. The Seahawks finished the season 5-11 and just days after the defeat Jim Mora was fired and Pete Carroll was hired as Seahawks head coach. Here are my keys to victory and some things to look for this week. With Max Unger likely back this week, the Seahawks will have their healthiest starting offensive line in three weeks. Given this I hope to see better pass protection of quarterback Russell Wilson which hopefully also translates into better production from Wilson. After 3 solid weeks, Wilson’s numbers slipped in his previous two games. Wilson threw for a combined 333 yards, 2 touchdowns, and 2 interceptions in back-to-back road games in Houston and Indianapolis and last week was the first week since week 2 his completion percentage was under 50 percent in a game. Wilson also has not seemed to be as accurate so far this year as he was at the end of last season. I think the offensive line could make all the difference in the world. I expect the Seahawks passing game to get back on track this week and I would not be surprised to see Wilson throw for between 250 and 300 yards against the Titans. This week is the first week that all of our pass rushers will play together in front of the 12th Man. This could spell disaster for Titans quarterback Ryan Fitzpatrick. Even though the defense struggled down the stretch last week, our front 7 still sacked Andrew Luck twice and recovered a fumble on a strip-sack. I think the pass rush will play a huge factor this week and Fitzpatrick will be sacked at least four times. 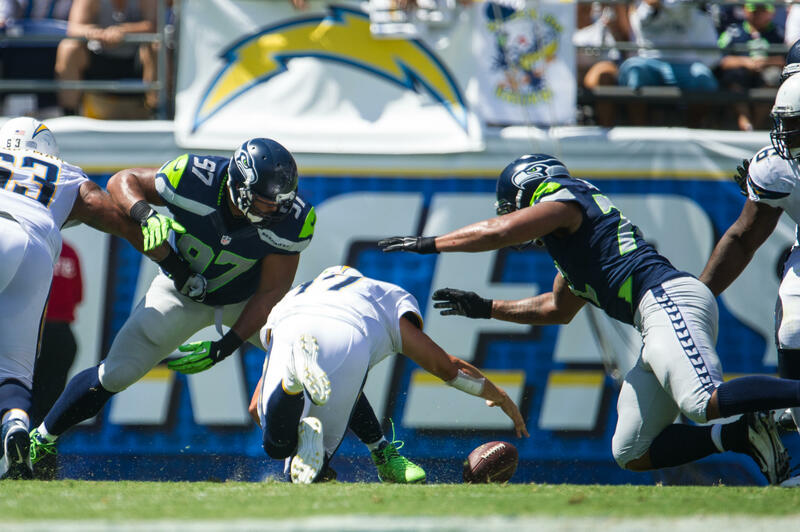 One thing that could affect the Seahawks on defense this week is linebacker Bobby Wagner. Wagner is dealing with a low grade high-ankle sprain and head coach Pete Carroll suggested that Wagner’s final game status could be determined during pregame warm-ups on Sunday. If Wagner cannot play, Heath Farwell will most likely start at middle linebacker. Wagner is the leader of the defensive huddle and he may be the most important defensive player as he relays the defensive formations to the rest of the defense. Wagner also has the second most tackles so far this season behind safety Earl Thomas. I am confident in Harwell’s ability to fill in but look for Tennessee to try to take advantage of the “weaker” middle of the field by dumping passes off to tight end Delanie Walker and primary slot receiver Kendall Wright. The Tennessee Titans have gotten off to a rather surprising start to the 2013 season. After starting the season 3-1 they lost in two aspects last week against Kansas City Chiefs. They lost the game, and they also lost starting quarterback Jake Locker for the next 6-8 weeks with a hip injury. Without Locker, the Titans now turn to Ryan Fitzpatrick to command the offense. Ideally with a backup quarterback at the helm the offense will turn to their running back to carry the load to try to take some of the pressure on the quarterback. The Titans definitely have a running back capable of carrying the load in Chris Johnson but playing in Seattle, Johnson may be facing a long and tough day this week. The Titans will be forced to throw a lot this week especially if the Seahawks can build a lead early on in the game. On offense for Tennessee this week my X-Factor player to watch is wide receiver Justin Hunter. Hunter, a rookie from the University of Tennessee, was a player I had my eye on at this year’s combine and the time before the NFL Draft. Hunter’s height and speed to break away from defenders made him a perfect #2 wide receiver immediately in my eyes. This week he will line up across both Richard Sherman and Brandon Browner depending on the play. The Titans have a lot of wide receivers that will see playing time this week. With Kenny Britt and Nate Washington receiving most of the attention, look for Hunter to possibly make a bigger impact than expected against the Legion of Boom. Last season Richard Sherman led all NFL cornerbacks in interceptions with 8. This year, the Titans feature a guy in their secondary that could wind up leading the league in interceptions by season’s end. Cornerback Alterraun Verner has intercepted 4 passes so far this season and I believe he has established himself as the permanent replacement to former Titan Cortland Finnegan. What is interesting about the Titans defense is that they have a handful of guys that are effective in rushing the passer and another handful of guys that are effective getting to the play and making tackles. My X-Factor player to watch on defense is a guy who falls into both of these categories, outside linebacker Zach Brown. Brown, a second year man from the University of North Carolina, has recorded a team-high 3 sacks so far this season and also ranks third on the team in tackles with 29. Brown has also forced one fumble. Watching him on film, Brown does a very good job at being the first defender to figure out what type of play the offense will run. He does a good job of getting to the ball and is has more of an impact on running plays than on passing plays. I expect Brown to rush to the right side of the Seahawks offensive line to catch J.R. Sweezy and Michael Bowie off guard. Random Thoughts: This is the first home game in three weeks and the only home game in the three weeks upcoming. Talk about a bummer from a fan’s perspective but I would rather knock out the majority of our road games now so we can enjoy back-to-back home games on two separate occasions later on in the season… The Seahawks will wear blue uniforms and blue pants this week… Carl Cheffers is the referee for Sunday’s game… Greg Gumbel and Dan Dierdorf have the call for CBS this week. They are CBS’s #2 crew, meaning they get the privilege to broadcast one playoff game each season so these guys are pretty good all things considered. Should be a good call if you’re watching from home… I’m changing up my pregame plans this week. I’ll be a bar north of the stadium, probably King Street Bar and Oven. I don’t think I’ve been there since the 2012 preseason… Oh yeah, pregaming starts at 9am sharp… I need to get more pink Seahawks stuff to wear for breast cancer awareness month. All I have is an NFL logo pink ribbon pin and a bracelet… Sunday is a 1:05 start, not a 1:25 start. I’ve stated in the past that this 20 minute difference is actually pretty significant and not as many fans are in their seats for the start of the game if it is a 1:05 start. To all the people going to this week’s game please keep this in mind. Be in your seats by 1:00pm (okay, 12:45 just to be safe). Prediction: Last season the Seahawks lost a close game to the Miami Dolphins and responded by winning 6 straight games before losing to Atlanta in the playoffs. I think that the Titans may open up this game with an early lead but the Seahawks will regain complete control shortly thereafter. Earl Thomas will intercept a deep pass and the Seahawks defensive front seven will force two fumbles. On offense, Sidney Rice will lead the receivers in yardage with 80 and a touchdown. Russell Wilson and Marshawn Lynch will both run for touchdowns and the Seahawks will get ready for the Arizona Cardinals with a 5-1 record. 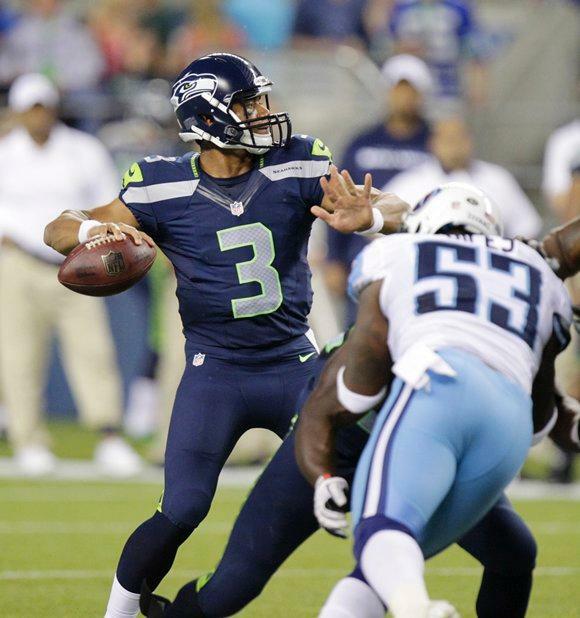 Check back Sunday night for a review of the Seahawks game against the Titans. I will be blogging a lot in the coming week as the Seahawks face the Arizona Cardinals on a short week in week 7. Enjoy the game. Go Hawks!